The Universities HTWG Konstanz, Reutlingen University and I.M. Sechenov First Moscow State Medical University will hold their Summer School on September 9-23, 2018 in Germany. The purpose of the Summer School is to learn about Information and Internet Technology in the frame of Digital Medicine. 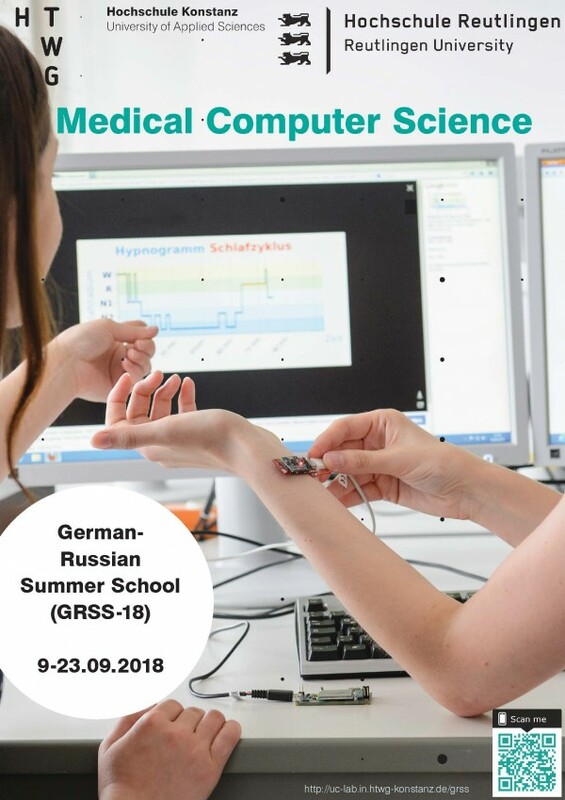 The Summer School will show a wide spectrum of theory and applications of current and future trends in medical computer science, including telemedicine, data science, cognitive systems, VR/AR, computer assisted operation rooms, medical information systems, blockchain, biotechnology, etc. The participants will a enjoy a mixture of lectures, visits to laboratories and external institutions as well as hands-on practices. The Summer School will take place at the campus of HTWG Konstanz and Reutlingen University. (Single events may change on short notice. Please check the current version on this website). Oliver Burgert is Professor at Reutlingen University for Medical Informatics. Currently, he is Vice Dean of the Faculty for Informatics and head of the Research Group „Computer Asssisted Medicine“. Oliver Burgert’s research interest is the intelligent operating room and optimization of the peri-operative area. In particular, he works on workflow guidance and situation awareness in the peri-operative field, modular system architectures for intra-operative systems, and application systems (surgical planning, image processing, …) built on top of those technologies. He has experience in Standardization and was responsible for several DICOM supplements. Recently nominated project manager for the "bwHealthCloud" project at the University of Tübingen. Before, he was a research associate in the section of Medical Informatics at Reutlingen University, with 5 years experience working on healthcare system integration projects. Primary interests are health interoperability standards and associated technologies. Prof. Coll-Mayor is Professor for distributed energy systems and her expertise lies on the application of new technologies in the integration of distributed generation. Prof. Coll-Mayor has a master degree in mechanical engineering and a PhD in electrical engineering. She worked as business developing manager and senior expert engineer before joining the University. Prof. Coll-Mayor has participated also in different standardization and regulation bodies in Germany in the field of integration of distributed resources in electrical grids and is active member of different committees such as the smart energy committee of the German electric and electronic commission or the blockchain initiative of the association of energy market and communication. She has participated in numerous project for developing innovative solutions in this field. Uwe Kloos is Professor for Computer Graphics and Visualization at Reutlingen University. He is also the Dean of the School for Informatics. Before he worked a couple of years at Hewlett-Packard and was responsible for the operation of worldwide distributed IT-infrastructure. His research focus is on working with and in Collaborative Virtual Environments. Together with a colleague he is responsible for the VRlab at Reutlingen University. The lab is a member of the Virtual Dimension Center (VDC), the largest VR-network in Germany. Professor for biophysics and biomaterials at Reutlingen University since 2012. Extensive research experience in biomaterials, cellular biophysics and biomedical sciences with co-affliation at the Max Planck Institute for Medical Research (Group Leader). Industry experience in photonics and developing of optical devices. Natividad Martínez Madrid is Director of the Laboratory Internet of Things and ot the the AAL-Living Lab at Reutlingen University. She is IEEE Member of EMC and member of the Steering Group for Smart Home&Living at the cluster lauched be the Ministry for Science, Research and Arts of Baden-Württemberg (Germany). Natividad is Vice-Dean for International Relationships of the University. She has more than 100 articles and several books published in the scientific research community. She has been coordinator of national and international research projects. Her research interests include the areas of Internet of Things, biomedical computing and Ambient Assisted Living. Ilia Petrov is a Professor at Reutlingen University since 2012, where he chairs the Data Management Lab. His research focus is on high-performance data management and analytics and database systems on modern hardware technologies. He has worked on data management and Business Intelligence at SAP. Ilia Petrov holds a Ph.D. degree from the University of Erlangen-Nürnberg. Consultant at the University Hospital Zurich/Switzerland, eHealth. Fifteen years of experience in telemedicine and lecturer at the University Zurich, Faculty of Medicine. Main focus of research includes the acceptance and feasibility of virtual patient consultation of different types of information and communication technologies including the telemonitoring of vital data. The evaluation of the effects on the health literacy of patients are of special interest. Ralf Seepold is Professor for Ubiquitous Computing at HTWG Konstanz. Ralf is Director of the Ubiquitous Computing Laboratory at HTWG where the main research lines are: Biomedical Computing, Mobile Computing, Smart Home & Living and Automotive Computing. He is Member of IEEE Engineering in Medicine and Biology Society, member of the Working Group Telemedicine in the German Sleep Society (DGSM), Steering Group Member and Founding Member for the Smart Home&Living Society and Coordinator of the Working Group ‘Modularity’. Ralf is leader of the Home Health Living Lab project and scientific advisor for the Online Learning Environment for the Electronic healthcare project. Christian Thies recieved his degree in Computer Science (Dipl.-Inform., 2001) and doctoral degree (2007) from the RWTH Aachen University. From 2006 until 2008 he worked as a research associate at the institute of neuroscience and medicine of the Jülich Research Centre. He was head of development and product management at ixmid GmbH, Cologne from 2009 until 2012. Since 2012 he is professor for medical informatics at Reutlingen University in Reutlingen. Gabriela Tullius is a Professor for Interactive and Collaborative Systems at Reutlingen University. Her interests are generally User Experience (UX) and Information Visualization. Her research focusses on collaborative systems such as working in collaborative virtual environments (CVE) and computer supported interactive learning (and teaching) environments (CSILT). Together with Uwe Kloos she is responsible for the virtual reality lab (VRlab). Christian Wache is Professor of Health Informatics with focus on Medical Informatics at the HTWG Constance, where he teaches among others "Clinical Information Systems" and "Telemedicine and eHealth". Before, he worked as a consultant at iSOFT Health GmbH and was responsible for the entire international product range as a member of management at MEIERHOFER AG. He is active in various committees, e.g. deputy head of the GMDS working group "Information Systems in Health Care (KIS)" or in the DMEA congress advisory board.